Amänō is a low profile but sturdy aluminum phone stand and grip all in one. Attach it to your smartphone to hold it steady, or use it like an easel to prop it up—hands-free. The ring rotates 360 degrees and feels comfortable no matter which way you’re holding it—and whether you’re a lefty or righty. The sleek design folds pretty close to flush, so the phone will still fit in pockets. Lightweight, strong aluminum gives Amänō a modern feel. And its simple, smart design is both a functional and sophisticated addition to your phone. Hello everyone! I'm proud to introduce Amänō to The Grommet. I'd be happy to answer any questions you have! Is tis made in the USA? @Jeanne Amano is currently made in China to bring it to you as economically as possible. Everything else, the box, the isopropyl wipe, the 3M adhesives, are all currently made in the USA. We found this supply chain the best way to bring you a quality product and maintain the best quality control possible before you receive your amano! I have a phone case over my phone and it's not smooth on the back. How does this attach, and would I be able to use it over my case? @Irma Amano works great with cases. The 3M adhesive is strong enough to adhere to most surfaces, even when slightly contoured. Note however, the slick feeling 100% silicone cases will not work as even 3M can't find anything to stick to it! We have stuck it to many cases and had full confidence in the connection. In general the best connection is a flat surface with a 40mm diameter flat area. We do supply some thicker adhesives upon request if you have a special case that you love and the extra foam in the alternate adhesive may help. Send a picture or link of your case and we can confirm if it is compatible. Amano is about giving you the confidence that you have a solid grip on your device. Even with the permanent feel, you can remove amano and restick with the supplied extra adhesive. That phone is expensive. We designed amano to give you the confidence, comfort, and style to use your phone. @Eric Will this work with the BodyGuardz Contact Case? @Cheryl Yes, it will work great with the BodyGuardz Contact cases. Right in the middle for regular sized phones. Just down from center on plus sized phones. Right in the middle on tablets works great as well. Great idea. How does it attach to the phone? Will it adhere to a leather backing? @Laura Amano is a 3M peel and stick adhesive. It will attach to a leather case great! Amano is meant to stay permanently on your phone. It is the thinnest most comfortable product like this, typically half as thick as any competitor. This makes slipping in and out of pockets effortless. Amano can be removed, and reused with the extra adhesive supplied. We found the most important aspect of using a device like this on your phone is to give you the most reliable connection possible. The adhesive we use does just that. 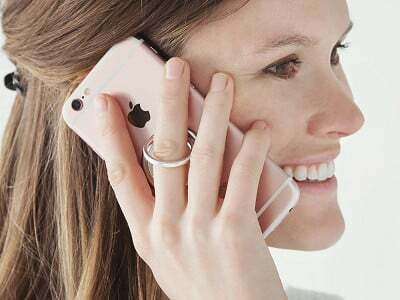 will the ring interfere with the use of charging pads that need to make contact with the back of the phone? @Renee The typical charging area on any phone is right in the middle. If you adhere amano to the lower part of your phone you can still lay the back of the phone across the charger. This tends to work well with larger phones as just down from center on plus sized phones seems to work best. However, on regular sized phones, right in the middle is the best place for amano, but still very functional and comfortable towards the bottom. Does the item ship with any instruction about what it is and how to use it? I'm thinking of sending to a friend and want to be sure she'll know what she's getting when she opens it! @Ruth Yes, inside the box is a small pamphlet welcoming you to your new amano, and showing the basic functionality. The Grommet has also put together a great video, above, that shows general use. We have continually found new ways amano helps in literally every scenario. Great, thanks. Are they ready to ship? If I order today when can I expect to receive? @Ruth Ready to ship! We will get them in the mail to you today. Regular shipping should arrive in 3-5 days. @Gregory We understand. We struggled with this too. However, we did not start designing and manufacturing amano to compete on price. We designed amano to be the best feeling, functional, and stylish product available to enhance your experience. Amano is cnc'd aluminum, polished, anodized, and laser etched. Each process is labor intensive. Each process brings you the finished product, amano, that becomes a pleasure to use. The aluminum complements the style of your phone and provides strength and confidence in the connection with your phone or tablet. We are happy to recommend more affordable options for you. The Grommet also carries the Popsocket, which is our favorite alternative. However we have found every alternative comes with compromises in design or quality. The Amano looks like a product I would buy but the price is too high. $10.00 would be more appropriate. I do not like to pay for the lack of economy of scale. @nancy It's like giving your significant other a tin foil ring, or a diamond ring. They both make the statement. Which one would you prefer? We choose the diamond ring experience. As mentioned above, we are happy to recommend something like Popsockets, sold here on The Grommet, for the $10 option. Great product for the questions they asked. Our price is higher than most because we asked different questions when designing. We want to provide you a quality experience. We want to give you a little moment of style, comfort, and security throughout your day. We want to give you all the functional conveniences to hook, stand, grip, and use your phone with ease. These approaches brought you amano. So it's made in China to bring it to us "as economically as possible" or you did not design it "to compete on price?" Which is it? Can't be both. @David Actually it is both. We looked at US manufacturing, and it would be almost $20 more in labor per unit. We found a great partner who has ties with quality manufacturing in China. We have developed a great working relationship with our team at the factory. By providing good communication and quality feedback throughout our team we have been able to produce a high quality product to give you the best experience possible. @Eric Great product! Can you tell me the diameter of the ring itself? Thinking it might be a good option for my brother who has Parkinson's Disease and drops his flip cell phone often, or it slides out of his hand. Lifting the ring could be a problem for him but I can probably resolve that by putting something under it to slightly raise it. But want to make sure he will be able easily get his (kind of wider) finger into the ring hole. THANKS! @Phyllis The ring has an inner diameter of 23.5 mm. We have not found a finger amano does not fit, at least to the second knuckle. Any takers on that challenge? We have had great response from ergonomic specialists and praise from doctors. I thnk it would certainly help and would love to hear about it. "I can honestly say as an occupational therapist, who treats patients with hand pain and as an ergonomics specialist, the Amano is a great invention. It decreases both joint and nerve stress in the hand from prolonged pinching and gripping while holding a device. The design is attractive and the stand is small yet functional. I am especially enjoying mine while exercising, Again, I highly recommend this product!" hello ~ does your product adhere to the MAGPUL phone case? @allison The executive case definitely. The other Magpul cases might be a problem for the standard adhesie due to the ridges. However, just make a note of your case when purchasing and we will include a couple foam core adhesives that will definitely work. Could this be used with the iPad Pro? @Kris Yes! Right in the center! It will give you the best iPad Pro experience. Amano is strong enough to trust with your tablet, and the center weighted experience gives the best option to hold and balance confidently in your hand. When placed down on a table, amano will be enough of a stand to type effectively and view the screen easier than flat. If you use the iPad Pro tablets to draw, sketch, or photograph, amano helps by giving you the confidence that you will not drop your precious tablet. I have an extensive 40 year background in product design, and manufacturing, of all kinds, especially cnc machining, anodizing, etching and so much more. I love the simplicity and elegance of the design, and thought I would buy several of these. However, I find the price not just a little high as many Grommet items are, but high to the point of being offensive, especially considering that you have already outsourced it to such a low cost country. $10 is reasonable (at Grommet), $15 is a bit high, but $30 is silly and makes me think twice about Grommet's management for allowing it. Hi Robb, thanks for the comment and the kind words. The simplicity and elegant design are big reasons why we chose Amano. We do have a less expensive option in PopSockets if that is what you are looking for. That sets the bar at $10, but this provides a more elegant alternative. We realize it may not be for everyone, but for a product that will be used every day, gives you security when holding your phone, and, like you said, has a beautiful design, it can end up paying for itself in no time. @Robb Thank you for the feedback. With such an extensive history, we would love to hear of any manufacturing opportunities you may know of that can make the same quality more economical. Then start thinking how much people spend on cases. On jewelry. On fixing broken phones. On the original and ongoing expense of your mobile phone plan. Then think about trusting all of that to a lower quality, less comfortable product. Amano actually costs quite a bit to manufacture and bring to you. It is not for everyone. We understand. We are always happy to engage with any resources you may have and listen to your experience. Do you think this would work well with a Kindle Paperwhite? I find the Paperwhite too big for me to hold in one hand and use that same hand to touch the screen to flip pages. @Judy The Kindle Paperwhite is a great reading tablet. I have one on my own Kindle and love it. It is best right in the center of the back of the Kindle. Because amano's ring rotates around the circumference of the base, it gives a wide range of ergonomic ways to hold your device. It allows a 'closer to the edge' hold using from the hinge side. When you want to set your Kindle down and enjoy a coffee while reading, amano will prop up your Kindle at a good angle to view and swipe pages. It even sticks to most cases for the Kindle. @Eric Great input -- you addressed all my asked and unasked questions. Thank you! Amänō is a low profile but sturdy aluminum phone stand and grip all in one. Attach it to your smartphone to hold it steady, or use it like an easel to prop it up—hands-free. The ring rotates 360 degrees and feels comfortable no matter which way you’re holding it—and whether you’re a lefty or righty. The sleek design folds pretty close to flush, so the phone will still fit in pockets.